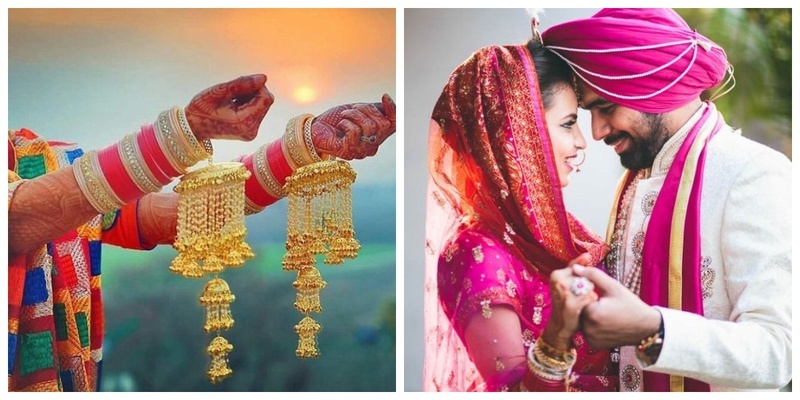 Punjabi Wedding: From rituals to Punjabi wedding dresses & songs, all that you need to know! Roka is the ceremony where the bride as well as the groom’s family exchanges gifts and shagun and decide on a wedding date. Roka is to signify that the boy and the girl are off the wedding market and no one else can ask for their hand in marriage. This ritual typically begins with a pooja known as ardaas to seek the blessings of the Almighty to consecrate the start of the couple’s journey. The chunni ceremony is the official engagement of the couple. Generally, the groom’s family visits the bride’s family with gifts. They give the bride a sari or a lehenga-choli along with a red dupatta called chunni. These gifts for the bride from her would-to-be mother-in-law is a token of acceptance as the fiancée of her son. Usually on the same day as the chunni ceremony, the bride and the groom exchange rings among close family and friends as a mark of their engagement to each other! Like most weddings in India, a Punjabi wedding has a mehndi ceremony too! The bride along with her friends and female family member apply henna to their hands and feet. While sangeet used to be limited only to the ladies earlier, it has nowadays become a full family affair! Both the bride and the groom’s families come together along with their friends to eat, drink and dance throughout the evening. It is a Punjabi wedding, so this is the time you can expect the daru ki nadiyan to flow! In this Punjabi wedding ceremony, the bride’s eldest maternal uncle puts red and white bangles on both her hands. The bangles are purified in milk and rose petals. While the ceremony is taking place, the bride’s face and head are covered as she is not supposed to see the bangles when her uncle is putting them on her wrists. Golden kalire are also attached to the bangles by the bride’s sisters or friends. They signify fertility and a happy marital life! The female members of the house apply a mixture of haldi, chandan, gulab jal and mustard oil on the bride’s body. Haldi is said to give the bride a radiant glow for the wedding day and wash off the impurities. A similar ceremony takes place at the groom’s home as well. After the haldi is applied to the bride and the groom at their respective homes, all the family member and friends smear each other with haldi for fun and merriment. It is a riot of yellow all over! Agwaani or welcoming the Baarat is done by the ladkiwale. The groom comes on a horse with his family members and is greeted by the bride’s family with a lot of pomp! In this Punjabi wedding ritual, the groom is given a sharbat called madhuparka, which is made of ghee, curd and honey to drink. The groom takes the madhuparka and sprinkles it in all directions before drinking it. In this Punjabi wedding ritual, the bride’s father gives her hand to the groom and asks him to take care of her from here on! Like most Indian weddings have the saat phere, so does a Punjabi wedding. The couple walks around the havan and takes seven rounds, each for one wedding vow. After this, the priest declares the couple as married. The bride’s brother takes rice flakes in his hands and gives it to the bride. She then offers the rice flakes along with the groom to the fire and seek the Fire God’s blessings. In this Punjabi wedding ceremony, the groom adds vermillion in the hair parting of the bride to signify the end of the entire marriage ceremony and the beginning of a new relationship between the couple. Punjabi brides have traditionally worn Punjabi wedding suits on the day of their wedding, however, brides today wear anything from a sharara suit to lehenga for the main wedding day! Find some amazing Punjabi wedding suit pictures that you can pin or save for your wedding outfit inspiration. No Punjabi wedding is complete without some naach gaana! And if you have been scouting for some Punjabi wedding songs to show off your latke-jhatke, then you got to check out these Punjabi wedding chartbusters, which you can blast on a music system and dance the night away! This Punjabi wedding song is a classic when it comes for the bride tribe to dance on the sangeet night! Tenu suit suit karda is the perfect Punjabi wedding song for the groom and bride to dance together! The name of this song is the Punjabi Wedding Song! Do I need say more? Ladki beautiful kar gayi chull is the perfect Punjabi wedding song for the groom and his friends to dance to! With this song you can take the entire fam and literally ‘nachde ne sare’ throughout the night! Definitely the “daru peeke nachne wala” Punjabi wedding song! You cannot not play this song at a Punjabi wedding! This Punjabi wedding song is another in the list for the bride and the bridesmaids to dance to! Forget a Punjabi wedding; no Indian wedding is complete without dancing like crazies to this hell-of-a-classic Punjabi wedding song! Let us know if something got left out in the big fat Punjabi wedding that you were expecting!